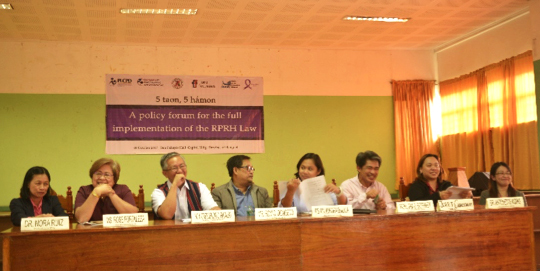 On October 18, the Philippine Legislators’ Committee on Population and Development—in partnership with the Forum for Family Planning and Development, the Filipino Freethinkers, the Health Action Information Network, and the Provincial Government of Benguet—held a policy forum on the full implementation of the Responsible Parenthood and Reproductive Health (RPRH) Law in La Trinidad, Benguet. Among the focal points of the activity was the Provincial Ordinance No. 17-204 or the Benguet Province RPRH Code, which had been signed last August 17 in order to strengthen the law and its implementation in the province. Benguet municipalities were encouraged to support the RPRH Law and Executive Order No.12 (on responding to Filipinos’ unmet need for family planning) and to uphold the sexual and reproductive health and rights of all citizens by addressing gaps and issues in both policy and implementation. Key challenges to the implementation of the law were also tackled, including the uneven implementation at the local level, the rise in serious adolescent RH problems (HIV and teenage pregnancy), the legal barriers to the procurement of contraceptives, the lack of public awareness about the provisions of the law, and insufficient funding. Representatives from the Department of Health (DOH) – CAR, the Commission on Population (PopCom) – CAR, the Department of Interior and Local Government (DILG) – CAR, and the Provincial Government of Benguet also discussed how the law is being implemented in the province.